Self-propelled Lotos artillery guns will be first to receive the heavy-duty armour system, which fires aerosol missiles at incoming bombs. Once it defects an attack, the shield takes account of the wind before launching the defensive projectiles. A block of cartridges field with the aerosol filling jams the incoming missile’s infrared system. 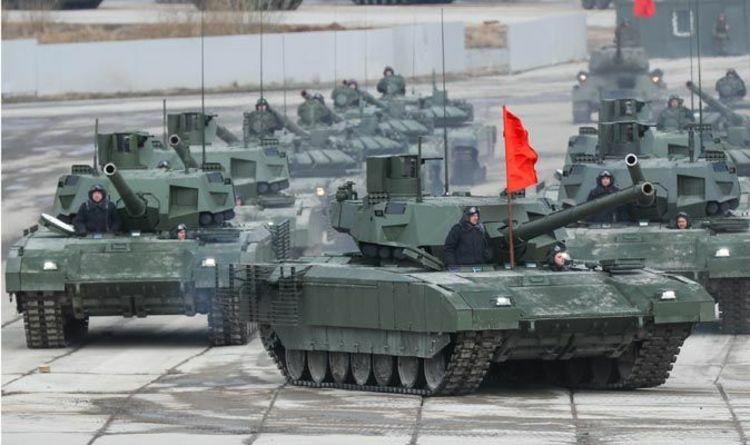 The new protection system will be mounted on the 120mm guns by specialists from Russia’s Central Research Institute for Precision Machine-Building (TsNIItochmash). A TsNIItochmash spokesman said: “During the flight, cartridges sequentially come into action and form an aerosol cloud of interferences in the visible, infrared and radio-frequency wavelength bands providing protection for an armored vehicle. “Engineers of the artillery section at TsNIItochmash are developing a new system of protecting the armor from precision weapons. “The technology is based on the optoelectronic suppression of the systems of guiding attacking smart munitions towards the target. Anti-tank missiles are among the most effective weapons hit the armour which is undergoing preliminary trials. Meanwhile, Russia, the United States and France test-launched nuclear-capable missiles within hours of one another as fears rise of a return to a Cold War-era arms race. The US fired a nuclear-capable Minuteman III intercontinental ballistic missile on Tuesday night. Shortly after, Russian armed forces fired a nuclear-capable RS-24 Yars ICBM. The 1987 treaty was signed by Soviet leader Mikhail Gorbachev and US President Ronald Reagan. It was widely seen as helping to bring an end to the Cold War.